It’s that time of year again! We have a large Maple tree in our back garden, which has many leaves to drop! Ray is happy to see “his” leaves again and is, without any doubt, thrilled with our lower temperatures. It is always interesting to watch him in his “fun times”, and reflect on just how far he has come in just over five years with us. He now has some social skills relative to both humans and canines, whereas he had none originally. He is very adept at stairs now whereas he initially did not know quite how to handle getting his back legs working with steps! His original desire to not be touched has changed to inviting physical contact, but his most rewarding change has been his change from a total distrust of all humans and other dogs … to “Mr. Sociable”! The first 18 months of living with Ray were easily the most demanding on all of us. We must assume that for all the frustrations that we experienced, he was probably experiencing much the same. Those first 18 months were certainly an emotional roller-coaster ride and, with Ray being my first dog, an instant education in canine matters. 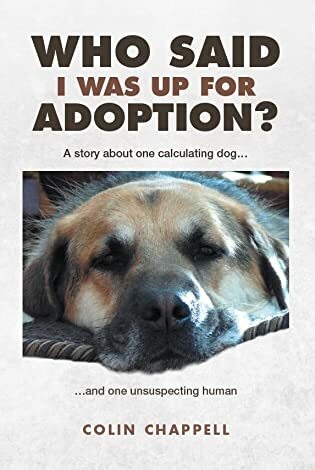 Those first 18 months are documented in my book “Who Said I was up for Adoption?” (click/select book cover in right column for more details), which could be the perfect gift for anybody who has a dog with issues, or who are planning on adopting a dog in the not too distant future. All net profits from book sales will be directed to the Oakville & Milton Humane Society, being the organization that initially rescued him, and who spent four months working with him in order to make him a feasible adoption possibility. They also provided their expertise to us at no cost as we tried to understand and address the many issues which Ray presented to us! With Christmas already “on the horizon”, “Who Said I was up for Adoption?” could be a great gift for the dog lover(s) in your life. Give the gift of Ray! I know, you are fully aware of the gift that he made it over those tough times. But there are moments when you stop look at him and be even more aware of it. Blessings to Ray! Ray is one gift that is guaranteed to bring smiles! He has come so far and I believe has brought forever smiles to your heart and Carol’s. The book is an engaging and fun read, but more importantly I learned a great deal about socializing a pet. This past May, we adopted a rescue cat, already named Freesia (a flower) and are still in the process of adjusting her to her new “parents” and her eighteen-year-old “sister” who has been Queen of the Household for years. It’s not happening. She doesn’t trust people, for she was taken to the local shelter after some kids set her on fire. After many surgeries and slow healing, she was put up for adoption, and when we heard her story, we stepped up. If it hadn’t been for reading Colin’s book, I would never have attempted such a daunting task. Thanks guys from both Freesia and her forever family. It’s been such a joy and a privilege to watch the metamorphosis of Ray as he blossomed over the years. Kudos to you and Carol for all your work and advocacy for your boy. On yes, do I ever! And happily so. I love Ray. He was willing to make changes to his disposition and has become a much nicer dog because of it. It’s a lesson for people. Totally agree with you. Given his general willingness to adapt; to give no value to superficial appearances; to treat friendship and loyalty in a way that shames so many of us, and to also maintain a pretty positive attitude to life ….. there is much we can learn. His life is very simple by our standards, but he is happier than many people I know.